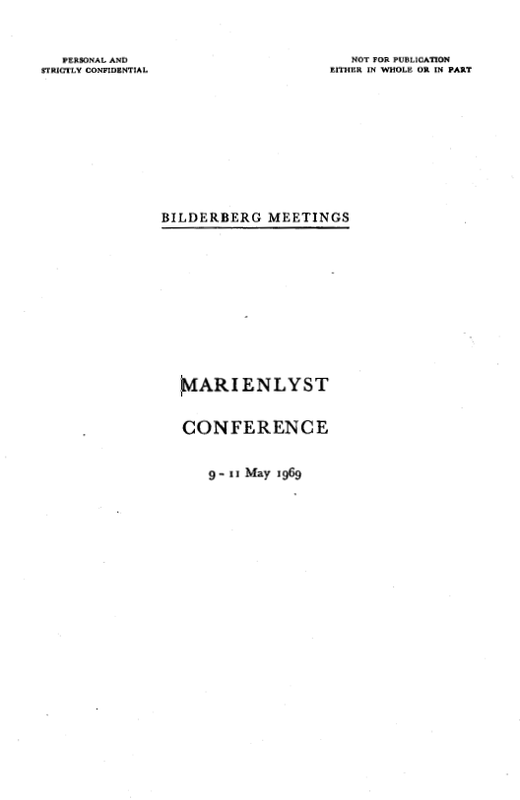 The eighteenth Bilderberg Meeting was held at Hotel Marienlyst in Elsinore (Denmark) on 9, 10 and 11 May 1969 under the Chairmanship of H.R.H. The Prince of the. Netherlands. There were approximately 85 participants from the United States, Canada and 14 Western European countries as well as from various international organizations. They consisted of members of governments, politicians, prominent businessmen, journalists, leading national and international civil servants and outstanding representatives of the academic world and other groups. In accordance with the rules adopted at each Meeting, all participants spoke in a purely personal capacity without in any way committing whatever government or organization to which they might belong. In order to enable participants to speak with the greatest possible frankness the discussions were confidential, with no representatives of the press being admitted. I. Elements of instability in Western Society. II. Conflicting attitudes within the Western World towards relations with the USSR and the other Communist States of Eastern Europe in the light of recent events.